My best memory was seeing Deja Vu close. I was a rides lead in 2007 and that was the FF season that the park decided to give the aquatics team the back part of the park which included Camp, Iron Wolf/Fling, American Eagle/Revolution, and Wiggles World. Because I started that season at Demon prior to being promoted they sent me back that direction. The park ended up adding Vu to the west portion as I'm sure they were hesitant giving that to the lifeguards to run. For the majority of 2007, Vu was finally running pretty decently (as I believe it was in 2005/part of 2006 that it was completely out for the count). Anyways, as I was going to clock out that evening, most of the full-time park employees were lined up along the backstage road taking their last videos of it running...although I can't really say too many of them shed any tears for it considering its troublesome past. 2007 was also the year that SWF met its demise and we had an inkling that Raceway wouldn't be too far behind as there were lots of different survey markers placed in the area. None of us actually missed smelling like gasoline after a shift was over! Not really a ride, but I had this fuzzy memory from when I was a kid of running through a vine archway. For years, I didn't know where it was at, or if I had imagined it. This past year, I saw an old picture of GAm and realized it used to be next to Demon! The only ride I do remember loving was Space Shuttle America. I first rode it when it was showing Escape from Dino Island. I was confused why we were in a space shuttle in the middle of the jungle, but it was fun. Elvira's Superstition was fun too. They used to decorate the inside with "bad luck charms" and force you to walk under a ladder to get into the theater. It would be nice to have a special effects theater again. Something like CGam's Mass Effect show. I really miss Superstition it was the perfect Fright Fest ride switch taking a rollercoaster ride through a haunted amusement park with Elvira AWESOME!! 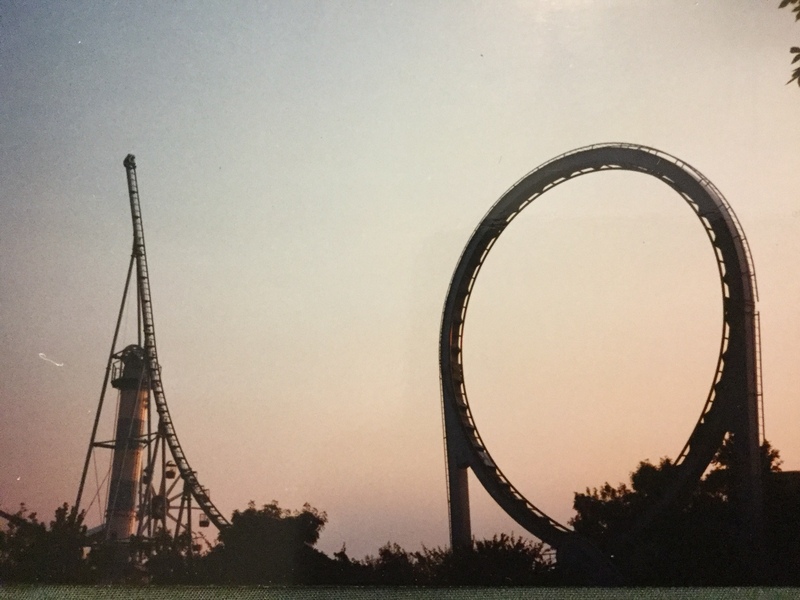 I always liked the way Shockwave looked as it was the first thing you saw coming into the park you knew you were going to have a wonder and awe filled day. Sky Whirl this thing was an engineering marvel 1 of 2 triple wheels in existence We need another one I'm sure Intamin has the blur prints in a vault somewhere. I rode GAR in the rain with some mild lightning that was AWESOME we just kept going around and around. SWF This was was the best way to get wet fast!!! it was a hot day back in 2006 and the group of friends I was with wanted to go on a water ride but everything was like 2 hours long so we went through the exit even though they said not to and stood on the bridge for 4 cycles we werd soaked then decided to go to HH by the time we got there we were dry, yup underwear too! Trailblazer was a fun little thing I rode this with a friends mom and she couldn't stop laughing because my screams were screams of terror mixed with delight and they sounded absolutely psychotic. Orbit will forever be one of my favorites It is greatly missed by me! I really hate the way the park is starting to look everything is all starting to blend together in terms of ride experience. It's becoming more about the thrill and less about family We need actual family rides Sky Whirl and GAR and even Haybaler are perfect examples, plus we also need high capacity to chew through crowds. benneluke wrote: Not really a ride, but I had this fuzzy memory from when I was a kid of running through a vine archway. For years, I didn't know where it was at, or if I had imagined it. This past year, I saw an old picture of GAm and realized it used to be next to Demon! Yes! I loved walking through that when I was a kid. I also loved that it provided a shady spot to sit and relax. There were always grandparents sitting on the benches under it. At least that's how I remember it. Hi everyone! My username probably gives away which ride I used to operate: Tidal Wave! I had so much fun on that ride! I was 16 years old at the time, and honestly, it was the best summer of my life. So, the mechanicals on the ride were pretty nifty. The pusher assembly on Tidal Wave was named “Oscar,”not sure why, but that’s what we called him-and it (he) was referred to as if it were a living being. There used to be two rotating orange lights in the station-much like one would see on a tow truck-and they let the operators of the ride know that the train was in the ‘danger zone’ of valleying if the emergency stop was engaged while the Tidal Wave train was on the runway. Tidal Wave’s train was quite heavy and therefore hard to stop. The crew I was on would turn off the station lights and launch the train. The warning lights were really bright and it looked like a disco club in the station! Lol We would make techno sounds into the microphones when the train was in motion and the lights were rotating. If you’d like to hear more stories, I have a ton! Not just about T Wave, but all the rides back around 1989-1990 when I worked there. That's awesome! [SMILING FACE WITH OPEN MOUTH AND SMILING EYES] Thanks for sharing!! Do you have any stories regarding American Eagle, Whizzer, Iron Wolf, or Shockwave?? SaveTheWAVE wrote: HThe pusher assembly on Tidal Wave was named “Oscar,”not sure why, but that’s what we called him-and it (he) was referred to as if it were a living being. Oscar was quite famous around here! I remember at least one name on another Shuttle Loop - I think this one was a Astroworld: Mighty Moe. SaveTheWAVE wrote: Tidal Wave’s train was quite heavy and therefore hard to stop. The crew I was on would turn off the station lights and launch the train. The warning lights were really bright and it looked like a disco club in the station! Lol We would make techno sounds into the microphones when the train was in motion and the lights were rotating. I remember those lights! I always thought they sort of went along with the nautical theme for Tidal Wave: the netting, anchor, life jackets, etc. Such simple yet awesome stuff! Wasn't there also a siren with the lights at one time? SaveTheWAVE wrote: If you’d like to hear more stories, I have a ton! Not just about T Wave, but all the rides back around 1989-1990 when I worked there. Thanks for your feedback, coasterjoy and CoasterDemon! Back in 1990, the ladies in park ops suffered a myriad of pranks and tricks from ride operations. One of my favorite was when a team member from Wolf called the ride down for people standing on the coaster! Park ops verified the call and sent maintenance out to look at it. Lol! The maintenance guys weren’t too happy. That kind of silly stuff happened all the time. I was there when a member of the T Wave crew called the ride down for going backwards. I was laughing so hard I nearly peed my pants. I’ll post some stories of ShockWave, AE, and Whizzer in future posts. I have plenty of stories of those rides, but I have the most stories about T Wave as it was my home ride. ^Great to hear this stuff. I grew up on these rides, Tidal Wave probably being my most sentimental. I was lucky to have ridden it probably 200 times in Kentucky, on a few quick visits to that park specifically for that ride. You'll be happy to know that both SFOG and SFKK carried on Oscars legacy, at SFKK Oscars name was airbrushed on him. For those that are interested in such things, there’s an excellent documentary about both Tidal Wave roller coasters in Gurnee and in California, but mostly California. It’s called “Tidal Wave at 25: Tidal Wave’s 25th Anniversary, 2002.” It’s produced by “ greatamericaparks.” It shows a lot of back stage footage and interviews with maintenance, as well as Oscar (not an interview lol), and great night footage. I didn’t want to share the link of the video on this site as this site is dedicated to SFGAm. But seriously, seek it out. It’s amazing. SaveTheWAVE wrote: For those that are interested in such things, there’s an excellent documentary about both Tidal Wave roller coasters in Gurnee and in California, but mostly California. It’s called “Tidal Wave at 25: Tidal Wave’s 25th Anniversary, 2002.” It’s produced by “ greatamericaparks.” It shows a lot of back stage footage and interviews with maintenance, as well as Oscar (not an interview lol), and great night footage. I enjoyed that documentary, SaveTheWave! Thanks for sharing!! 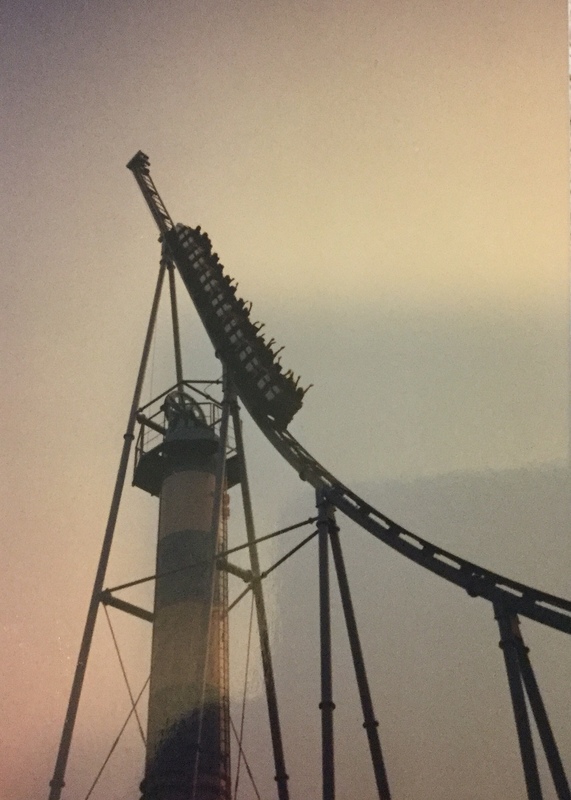 One late-summer night around 2005, my friend and I made Deja Vu the last ride before the park closed. The ride cycle was without error until the train made the connection with the catch car on tower 2. We were pulled to the top of the tower, and then...nothing. The Deja Vu train with all it’s passengers, and my friend and me, slowly made its way to the bottom or the tower. Every person aboard laughed in unison. It’s been over a decade since that ride. I will never forget it. I remember standing on the bridge for Splash Water Falls! That was awesome! I think I might have even walked up the exit ramp to 'only' stand on the bridge! Ragin Cajun was my absolute favorite when I was around 8 years old. Went to SFA after it moved there and still didn't get a ride. Oh Well. Orbit I rode once just for the sake of riding it. Not that I didn't like it, I would just rather spend my time doing other things. King Choas I rode maybe a total of ten times. It always depended on who I was with and if they wanted to go on it or not. I enjoyed it though! Here’s a bolt that I have from the Tidal Wave. It was sent to me by a friend that I haven’t seen in decades. I’ll upload some excellent shots of Tidal Wave from the 1991 season if you’d like to see them? That's awesome! I'd love to see some pictures of Tidal Wave! Okay, SFGAM_Hog, here you go! I’ll post some more when I get back from studying. Thanks for that! And for the photos too. Tidal Wave had so much soul, the tracer lights and the howling winds, the adrenaline of the launch, the perfect loop, and humanizing details like 'Oscar', it is still among my very favorite attractions. Also the way it was built in Yankee Harbor it was the perfect backdrop-set piece for the land. Please keep the photos coming, I very much appreciate them. Also, do you remember the push device for 'The Edge' was also named? Felix. So for those seasons Edge and Tidal Wave operated side by side it was Felix and Oscar.